Podquest: No Strangers to Adventure – A Close-up – GHOST PARTY! It’s finally here! A Podquest post! Let’s kick off with a close-up look at the three characters that will be dealing the damage, solving the mysteries, committing the crimes. The accompanying image is from the thumbnail artwork for the podcast: Kelsey’s interpretation of the three trudging through a magic/windstorm, in clothes probably a bit nicer than the characters usually wear. The tall, brooding wolfman in the center is Giacabo Pale Eye, a Druid Shifter, played by Nathan. Giacabo is half human, half wolf, half adventurer from an outcast tribe of Shifters afflicted by a mysterious blood curse, who’s also a doctor. An emerald-befitted mummified crow’s head serves as his source of magic, and a cane sword serves as his weapon. On the right: Digby Sudsworth (Esq. ), a dwarf Bard-tender, played by Dylan. Digby is a phenomenal listener and weaver of tales, which just so happen to be perfect tenets of a great barkeep and bard. On his back is a hefty keg of beer; while full it is a disadvantage to his dexterity, but swings like a mighty warhammer when attached to a handle. 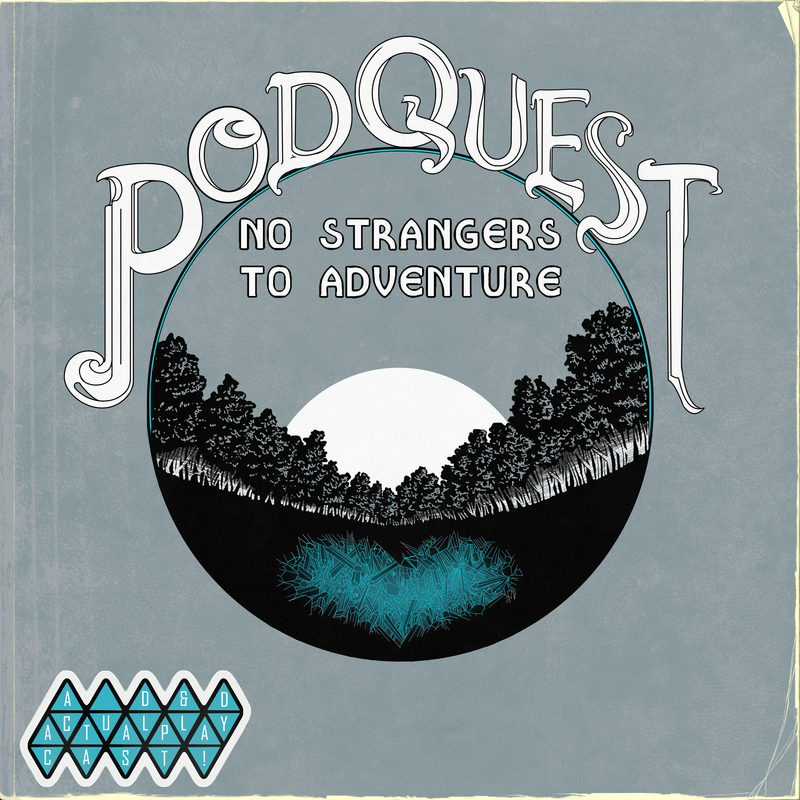 Podquest: No Strangers to Adventure already has several episodes available for the listening! There is also a short introduction that captures the feel of what the show overall has shaped up to be. If you’re unfamiliar, the podcast is a live recording of the four of us playing our first campaign of Dungeons and Dragons ever. So far, playing 5th Edition has been incredibly fun and rewarding for us. Already, we’ve learned so much and have found a play style that’s relaxed and goof-friendly. The episodes follow an overarching cooperative narrative in an improvisational structure. We build a fantasy world together one joke at a time. The decision to make this a podcast came easy; Andrew and Kelsey enjoy podcasting Big Money Movie Ideas already, and recording our D&D sessions together with friends is a way to share and document this cooperative storytelling experience. If you’ve never played Dungeons & Dragons, it is amazingly rewarding creatively and socially. With a rule-guided framework, the cohesive story we’ve been able to spontaneously create together has been surprising, and surprisingly fun. As our story continues, we look forward to future guest episodes, more original music and artwork, and being able to share in all of this with you.